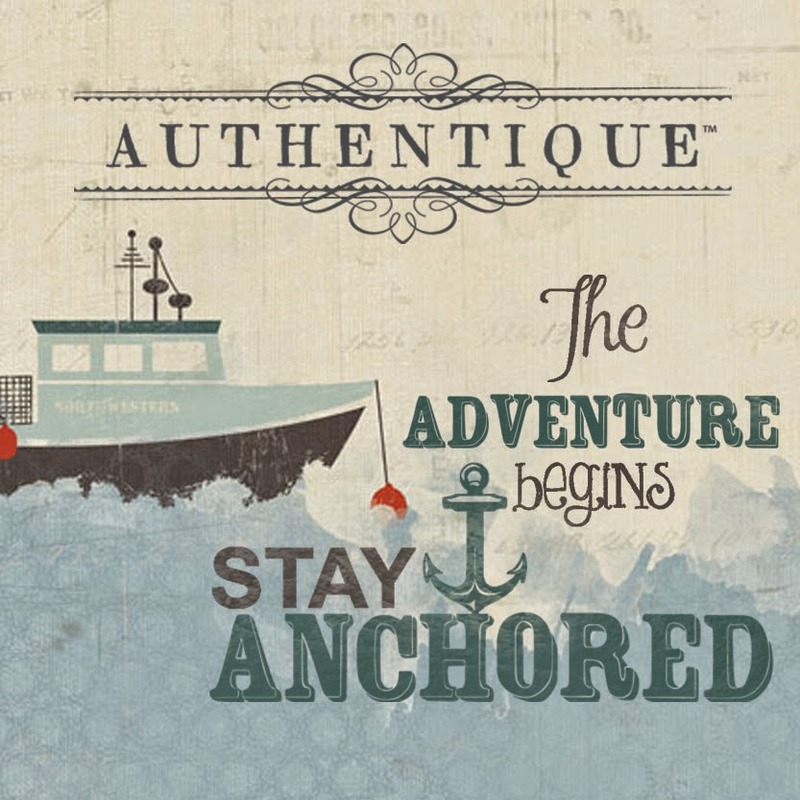 Authentique Paper and Petaloo are teaming up over the next week to bring you tons of "Nautical" inspiration using Authentique Paper and Petaloo products! The beautiful sunshine and these fabulous products from Authentique and Petaloo inspired me to create a beachy fun layout. I knew when I found these vintage pics of Marilyn Monroe, they would be perfect for this project. I love the "Anchored" collection. The red/white/blue nautical theme papers are so versatile. I used a journaling card for my title. What a great saying, "Keep calm and stay anchored". What's more calming than a day at the beach? 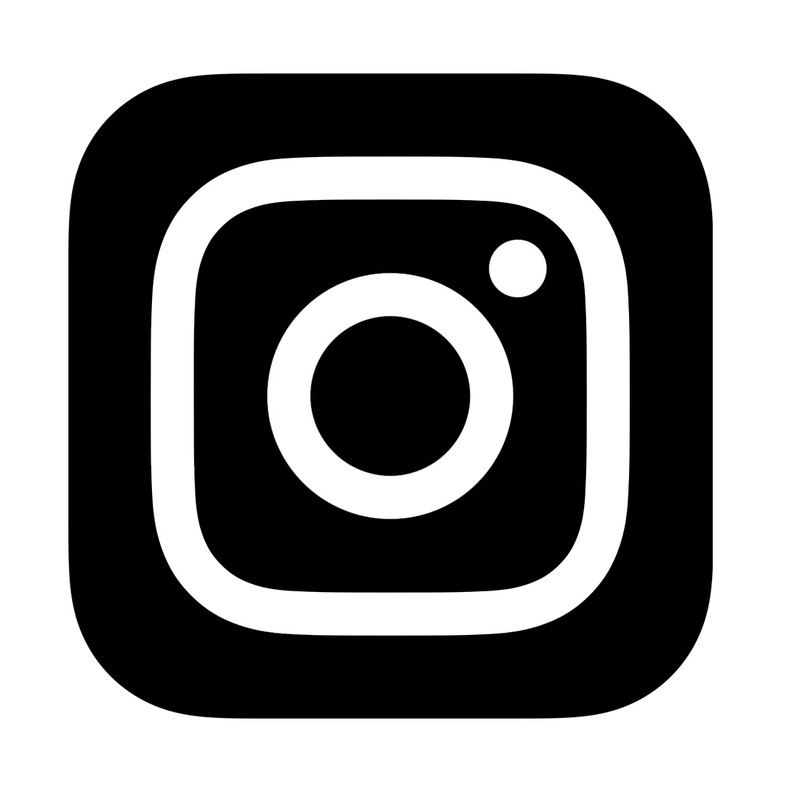 What can you create with Authentique and Petaloo? Good Morning! 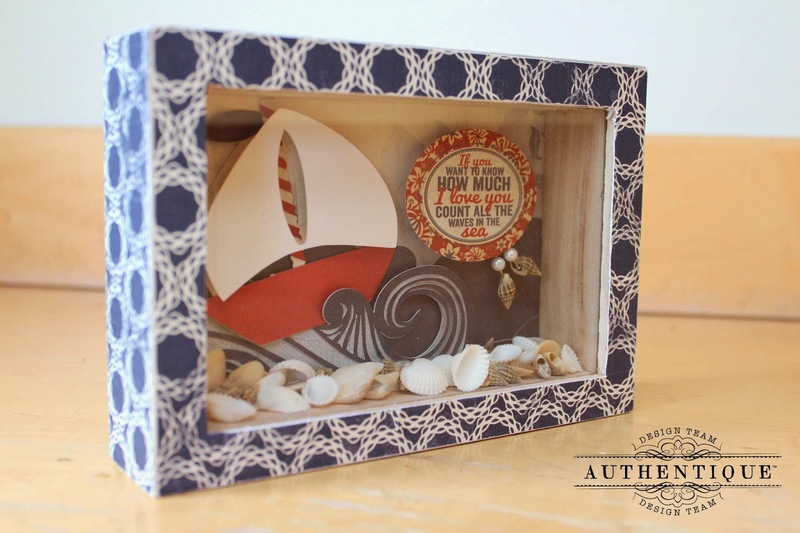 I created a fun summery shadowbox for you today using Authentique's Anchored Collection and Petaloo products. I started with a fun SPC shadowbox, then started layering all of my pieces inside. To start, I cut down a piece of Embark paper. Then, I cut the boat using my Silhouette Cameo (Secure, Sailing, Cruise & Details). I then layered the waves using Calm and Pacific papers. I wanted some dimension, so added a pure white piece of cardstock for the sail, and used some thick dimensional adhesive to make it stand out. I also added dimension, by only partially gluing down the top layer of the waves, then bended them to stand out more. The flag on the boat is also just slightly furled. Instead of the mast, I used part of the border stickers from the Details sheet. To make the sentiment stand out, I used some more dimensional adhesive to pop out the Details sticker, then added two of the Petaloo Sea Shell Stick Pins for interest. Then, before closing up the image in the shadowbox, I added the Petaloo Bag of Sea Shells. I love how the sea shells will move as the piece gets moved around. Lastly, I used my Xyron 9" Creative Station to attach the pieces of Secure to the outside of the shadowbox, then sanded down the edges. Now it's ready to be displayed and help welcome Summer! The shadowbox and layout are amazing. Love the colors on the layout with Marilyn's black & white photos. Holy cow! All those shells....wow! I'm in love with new nautical themed collection! The design team has done a fabulous job! Keely, I like the way you represented the beach in your project. Very cute. Love the seashell stick pins. Wow, everyday I am blown away at the awesome projects here! Love the shells and details that give that layout dimension! Awesome shadowbox, so cute! Amazing projects gals! I'm always blown away by the creativity! Love the seashell pins, the flowers, the nautical theme that is sooo our family! Thank you for sharing with us. Both ladies did a great job! Both projects are just fantastic. If we had to pick between the 2 I would find it very difficult. Thank you ladies for being part of this Hop, so that I had the chance to see your projects. Omgosh, I love everything about that layout!!! The shadow box is fabulous too. 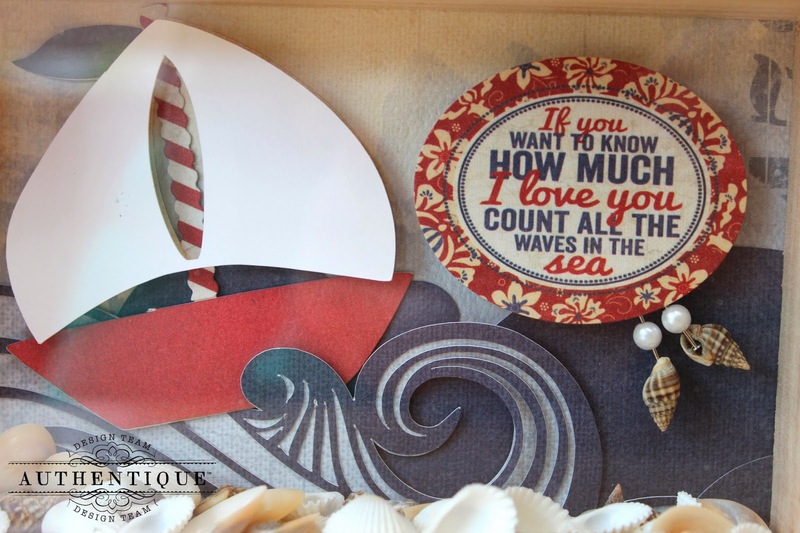 that little shell shadow box is adorable--love the sailboat; that layout is really pretty and what a great saying! absolutely loving the Marilyn LO-the photos are fabulous and you've added so much texture and detail!! I have a Silver Screen album and have scrapped her and several others. How amazing is that MM layout! I love the shells and the 'bubbles'. So many great details. The shadow box is adorable. It would look so sweet in a toddlers room. What a beautiful collection and even more beautiful projects. Thanks for sharing! This fabulous shadow box would look so good on my summertime mantel! Wonderful projects. Love the shadow box. You all are making me want to smell the ocean and get my feet wet, the salt taste in the air!!!! Great shares. Love Petaloos! and Authentique. 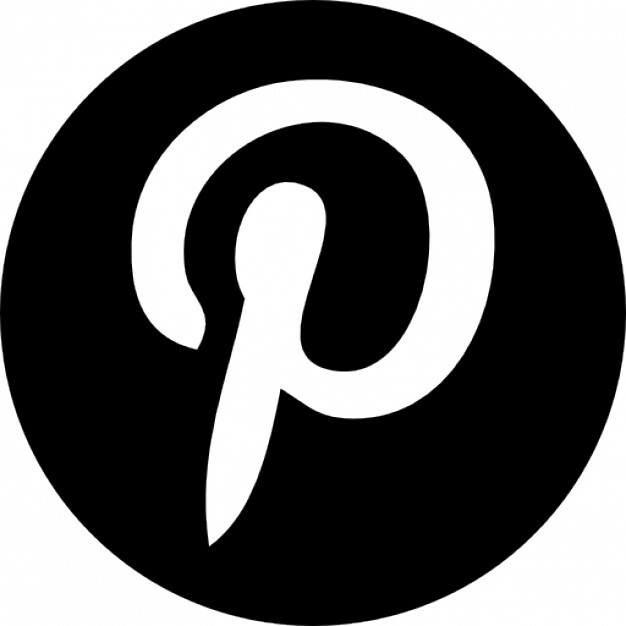 Great projects, love Authentique and Petaloo too. 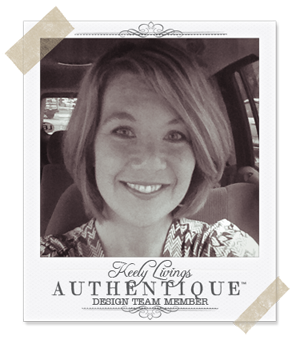 That is an awesome page Keely, love the retro look! I actually collect seashells, so these projects are pretty fabulous, I especially love the shadowbox great for showing off the collection, but love how seashells were used on the layout, the colors, everything is fabulous. Love these new, fresh layouts. A taste of the summer to come. With a cottage on a lake this collection is a must have ! And those flowers make it complete!!!! Love the shadow box. Both projects are great. Just like the shadow box as it would be a good way for me to display some of my prettier shell collection. You girls are totally rocking this line! cute projects and fun line! I am so in love with this new line of paper! The projects today were great, love how both designers did something different with their ideas. Thanks for sharing with us. WOW!!!!! Stunning projects from some very talented designers!!!!! Love ALL of it!!!!!!! Such a fabulous lay-out and that shadow box turned out completely amazing! Beautiful layout and the shadow box is amazing! Beautiful projects! LOVE that sweet shadow box!!!! Just saw the Petaloo post on FB. These projects are gorgeous. I love the sentiment in the box. Super cute projects, love the shadow box! Very beautiful! The more projects I see the more in love with these papers I am. So many ideas running through my head. Great layers on the layout and love the idea of the shadowbox. What awesome inspiring projects the sights, sounds and scents of the beach were present in each project. Thank you for sharing your amazing talents with us. 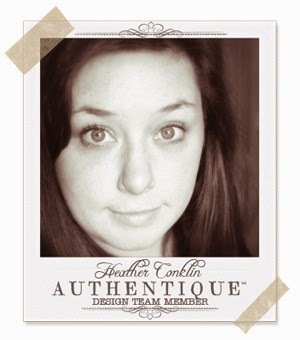 Love all the products and creations! Crossing my fingers in hopes I win! Beautiful layout! I love the layering and shells. These two projects rock today. Of course the new "Stayed Anchor" collection contributed to it. Awesome is all I can say. Lovely projects. Nice projects. The layout has lot's of fun elements and layers. 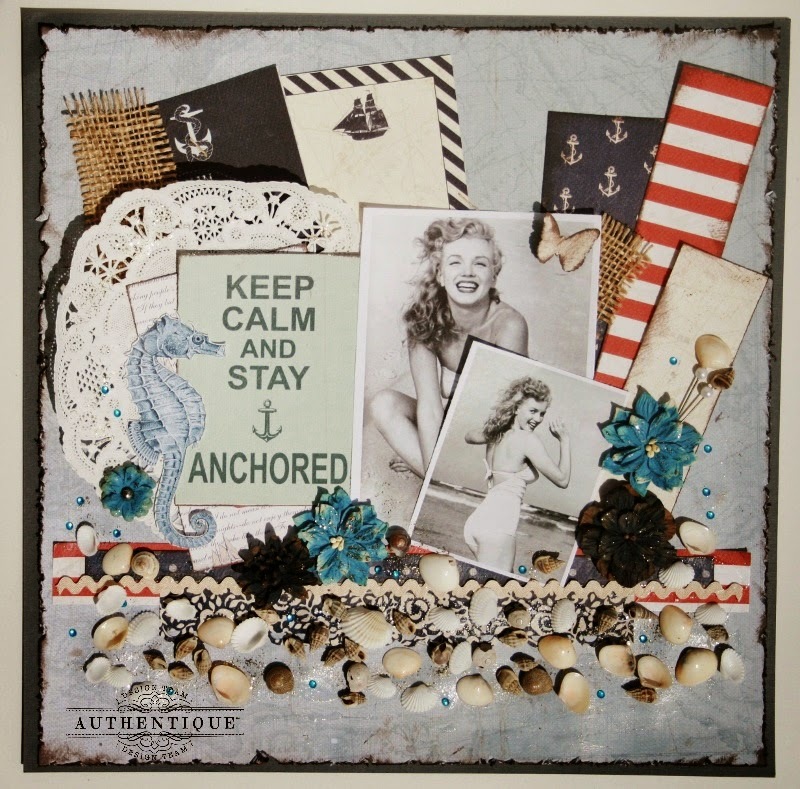 The shells look great going across the page and the burlap goes well with the nautical theme. The shadow box is very creative! I LOVE that sweet little shadow box! It would look wonderful in a kid's room! What great projects! I love beachy anything so they both caught my eye! 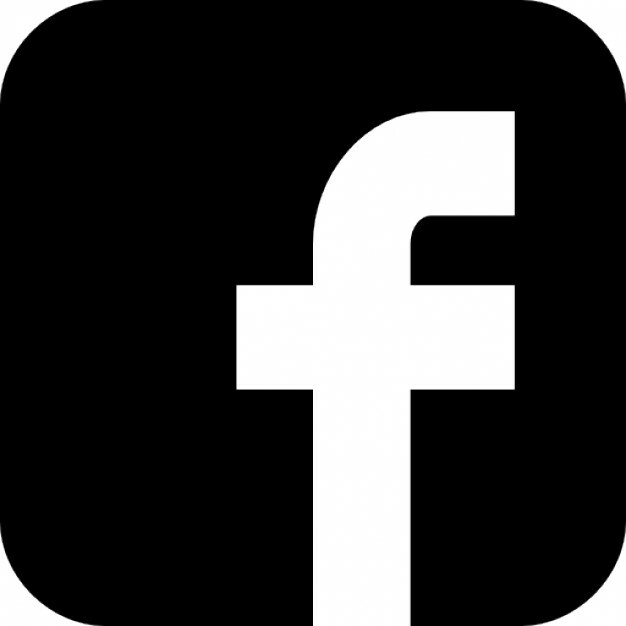 This is a fantastic giveaway! Thanks for sharing it with the rest of the world! These are fantastice versatile products and can be used in a multitude of ways that is only limited by the artists imagination! Amazing projects. 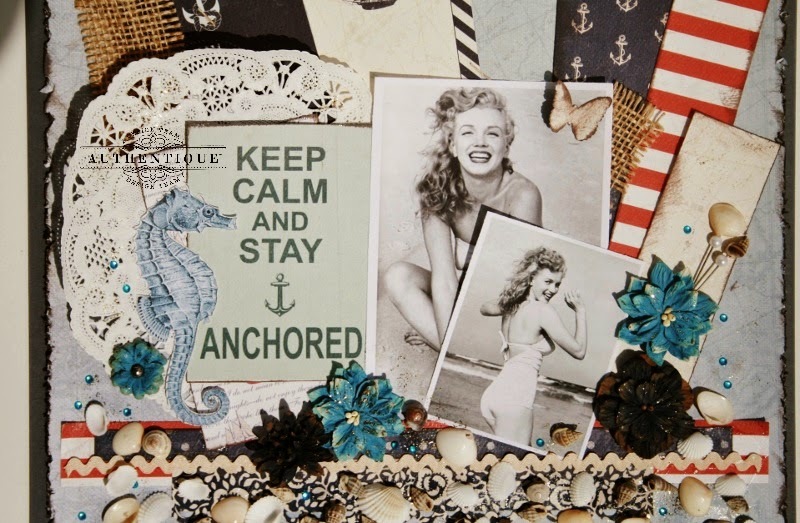 Love the waves and shells in the diorama and that scrapbook layout is fantastic. i love the projects. love the paper collection. love the layout thanks for the great inspiration. Wow! 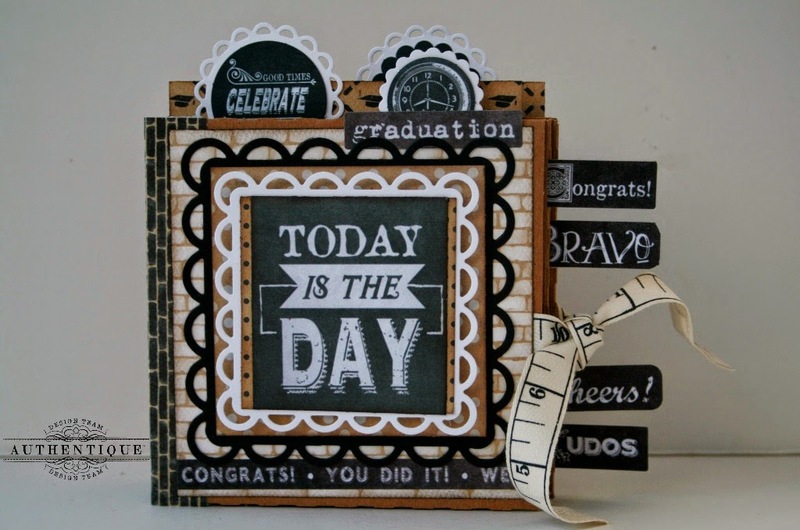 Both projects are gorgeous and love how they used this line and embellished it beautifully with the Petaloo pieces! Stunning projects today! So much inspiration! TFS! Love the patriotic colors and the ship with trim is awesome. Love both projects! Love the shells with the layout. And I love the waves in the shadowbox. Great job!! Thanks for sharing. Wow, I love both projects. The papers look amazing with vintage photographs. I love the shadow box too, and the added pins. 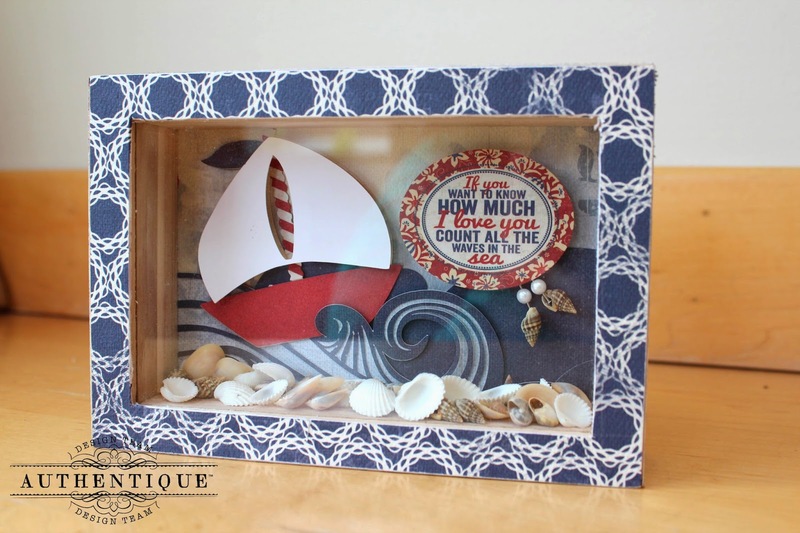 I'm ready to "sail away" with this shadow box!! I've always loved the nautical look, these are awesome papers and I can't wait to work with them. The lighthouse lantern is sooo unique....my mantel must be lit by this lighthouse!! Thanks for the chance to win awesome supplies!! I've thought about making a shadow box because I like how you can put actual objects in them. Yours is real cute! 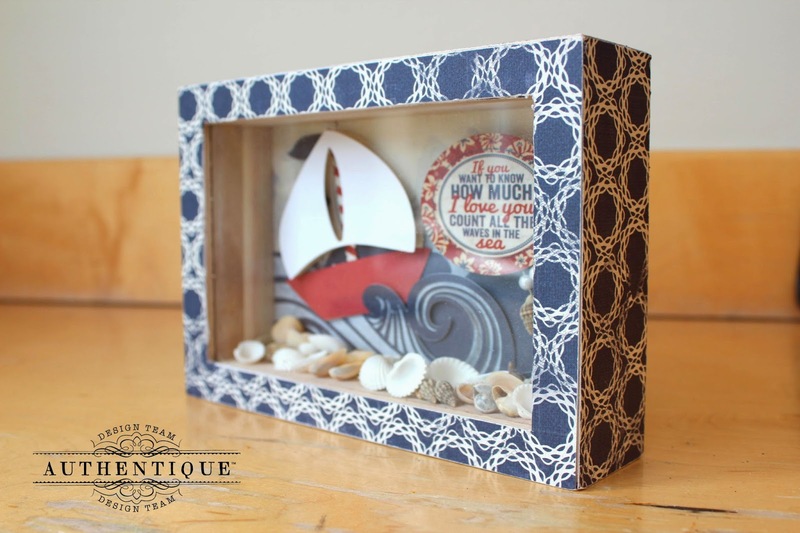 I am blown away just like this adorable sailboat shadow box! Your Marilyn layout is so gorgeous as well!! Wow!! Totally in awe!